I really love the trackpad on my MacBook Pro and finally got to the point where I stopped using my Logitech Mx510 mouse with it. While the trackpad doesn't give me the control that a mouse does—especially when doing fine point adjustments in an image editor—I found myself quite comfortable just using the trackpad nearly all the time. My wife however will be a different story. Her birthday is Monday and I've pretty much put the finishing touches on the MacBook I got her. I know however that she hates trackpads and since she's already going through enough of a change from Windows to Mac I figured I would get her a decent wireless mouse to help ease the transition. I had a couple of people on this blog mention the Logitech VX Nano as a great little mouse and decided to give that a try. Though what I really wanted was a Bluetooth based solution I heard several reports of the Bluetooth mice having interference issues and as a result not being smooth all the time. When I bought my wife's refurbished MacBook I got it with the smallest amount of RAM I could get, in this case 1GB. The reason is that Apple charges a lot more for memory than what you can buy from aftermarket sellers like Memory America or Other World Computing, both great resource for Mac memory and hard drives. 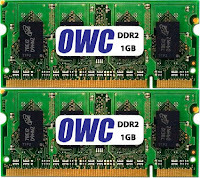 I purchased a 2GB memory upgrade from OWC for $41, which included the cost of shipping. For perspective if you bump the memory on a MacBook from Apple up from 1GB to 2GB there is a $100 charge for it as of this writing. The nice thing about the OWC site is that they will help you identify exactly which memory works for your model of MacBook. If you have another good resource for Mac memory please add it to the comments below. When I purchased a refurbished MacBook for my wife I also grabbed a refurbished 500GB Time Capsule from the Apple web site at the same time. At $249 it saved me $50 off the price of a new one and should provide a nice simple way to keep her MacBook backed up. Since I made the switch to Mac I've been raving about the simplicity of Time Machine and having a Time Capsule behind it sounded perfect. Ah, the sound of a delivery truck in front of the house is always a welcome sound for a gear-head like me. I've gotten to the point where I can distinguish between UPS and FedEx by the squeal their brakes make. After a 1 day delay because I left the house for 15 minutes yesterday and that happened to be the window for the FedEx Ground guy, I had to wait an extra day to actually get my wife's new MacBook in hand. As you can see from the picture below, Allison's refurbished MacBook came in a rather nondescript cardboard box, a far cry from the slick version you get when you buy new. The machine inside however looked completely flawless. There were no marks and it appeared like a brand new machine, though it cost quite a bit less than a new one at $949. I pulled out the machine, fired it up and started to go through the registration process. It quickly saw and attached to my wireless network and after a few minutes I was sitting at the OS X desktop. Though I started playing with Skype a couple of months ago I did it primarily as an alternate video conferencing option to iChat. My family members in California running Windows never seemed to be able to get their video based AIM tools to work, yet once they installed Skype we were able to hook up quickly and easily. All was good and Skype became my occasional use tool for chatting with the family and a few Skype enabled friends. When I made the switch to Mac from Windows one of the things that I enjoyed the most was having access to a full featured console window. The Terminal in OSX is much more powerful than the Command shell in Windows out of the box. Not only do I have quick access to all of the great Unix commands for things like file viewing and management, I can quickly SSH into my remote Linux based servers very easily. The new commercials Microsoft is running are now out, disclosing the strategy Microsoft will be employing to make the argument to buy Microsoft based products now and in the near future. Apparently the strategy is to mildly amuse people and convince us that Microsoft has some great new stuff coming out, as evidenced by Bill's subtle gestures to Jerry at the end of each commercial. As is typical of the Windows experience, there seems to be a lot going on in these commercials, in sharp contrast to the simple presentation of products and solutions in the Apple commercials. Since iTunes was released today I figured I'd try it out and see how it worked. It was a relatively quick download and included a new QuickTime Player update as well. All told it was 54.8MB for my Mac Pro and 67.5MB for my MacBook Pro. After a reboot iTunes was ready to roll. It asked me if I wanted to turn the Genius on. Doing so requires that your song information is sent to Apple in an anonymous form so that trends in music can be established and dynamic playlists created. Here's a link that tells you a little more about what Genius is actually doing behind the scenes. After years of delays Electronic Arts finally released Spore, a game that allows you to create your own life forms, starting at single cell entities and moving them up through intelligent life forms that can travel into space. The hype surrounding this game has been pretty big for years, mainly because of footage released a while back showing off the creature creator in very early stages. The game appears to be selling well in it's initial run, though not without some strong controversy over the Digital Rights Management (DRM) used in the game. Just take a look at the reviews of the game on Amazon and you can see the incredible anger people have over the DRM that's included. As a software developer myself I understand the reason a publisher wants to have a copy protection scheme in place. All too often software and copyrighted material is simply pirated without any regard to the people that created the product in the first place. Though I received a screen protector with my dermaSHOT case it recently became a bit scratched up and got a couple of small nicks in it. I figured screen protectors are kind of disposable so I went out to my local BestBuy to see what they had in stock. I looked at a couple of different products but one jumped out at me: the ZAGG invisibleSHIELD. There was only a single shield in the little box, unlike a competitor that had 5 shields in it, but it came with a lifetime warranty. Reading through the information on the box it looked like it was worth a try. The invisibleSHIELD claims to be made from the same material designed to protect the leading edge of helicopter blades. The material itself is very durable and reminds me of the invisible car masks applied to the front of cars. I figured that anything designed to withstand supersonic gravel pelting would probably be overkill on my little iPhone but that's fine. One of my favorite pastimes when I was purely a Windows guy was playing games on my machine. In fact, my last Windows machine was designed from the ground up to be a gaming rig first and foremost—with gaming being a very demanding application type, everything else I needed to do was easy. About the time I got into Macs I was burnt out on the gaming scene, switching my down time to playing with my new Mac and working on this blog. Lately my favorite game from the Windows platform—Team Fortress 2—received a significant upgrade with some new game types, maps and features. I decided to check it out and see if it was as fun as I remembered.